Our chess programs are designed for students of different ages and levels of experience. ● On-campus chess classes are designed for K-12 students. 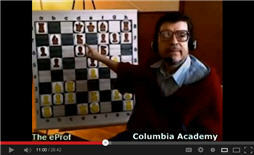 ● Online chess classes are taught in a virtual classroom and designed for students of all ages. Through a commitment to excellence, students receive appropriate instruction based on their individual needs and our chess tutors help them to develop gaming skills. While beginners learn how to play chess, advanced players can improve analytical combination visualization and master their tactical skills in chess. 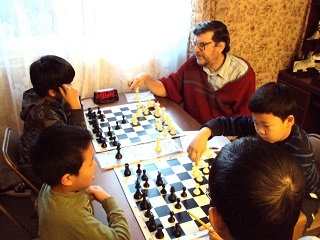 Students learn chess rules, complete theory of chess strategy, including opening strategy, middle-game play, and endgame strategy, chess tactics and calculation, attack and defense, evaluation and converting a material advantage, counterattack, and all aspects of any situation that may occur on the chess board. Our chess lessons usually run 1 hour and are scheduled weekly or can be taken twice a week. Each on-campus chess class consists of a theoretical lecture followed by a practical session, where the students have the opportunity for supervised play with other students of similar levels. The content of each chess lesson within the curriculum is determined by its chess instructor according to the student’s appropriate level and additional home assignment can be given to reinforce and extend the lesson. All of the students participate in chess tournaments.